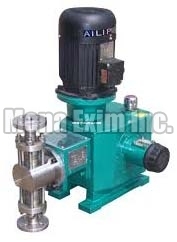 The company is a reliable Manufacturer, Supplier and Exporter of Dosing Pumps. Our Dosing Pumps are manufactured in compliance with set industrial norms. Few words that better describe our Pumps are high mechanical strength, long functional life and reliable performance. Owing to our brilliant logistics network, we are capable of delivering bulk orders of the Pumps within the promised timeframe. Buyers can obtain these at nominal rates from us.